Logic models are visual graphic depictions of a step by step process to achieve a desired goal. Public health planners and community planners use logic models to help communicate their vision for a project, a program or new plan. The logic model identifies resources and the activities that translate into an outcome that impacts the target population. 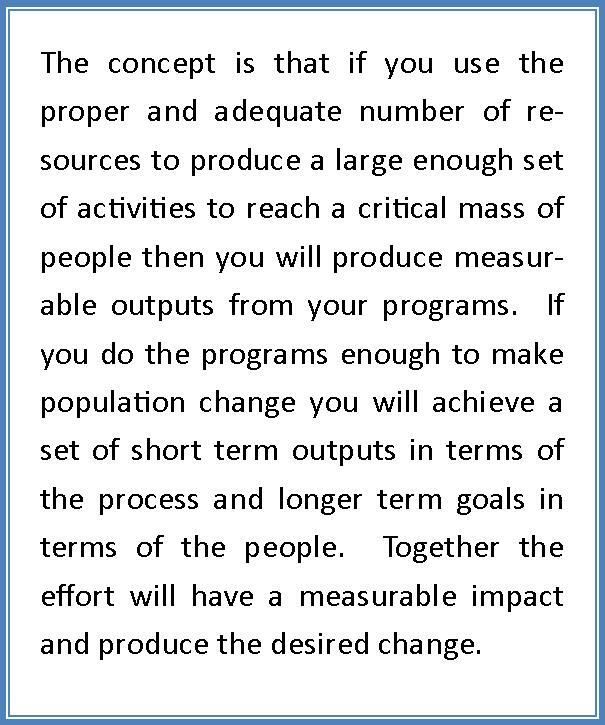 The “logic” is that if one has enough resources and does enough activities with a correct process there will be measurable outputs/results. With enough outputs affecting enough people there will be measurable change in the population – the impact. For each of the five steps of the traditional logic model there are identified and measurable points and movement forward from left to right. The graphic depicted here identifies how to create a logic model by starting at the end with identifying the desired impact of the work. The planner then documents the outcomes that would lead to the impact, then the activities that would produce the outcomes and so on. Logic models are part of implementation planning and help share the vision with the team and any community partners in the work. Logic models are often required for grants to demonstrate that the applicants have adequately planned and that they understand the process and details important to their project. Logic models are the project overview that is often paired with defined goals and measurable objectives as well as timelines or Gantt charts that complete the action plan. In Public Health logic models are part of national funding grants and state developed health improvement programs. Logic models are part of local community project planning and implementation. ToP Network PHiT Committee is developing a logic model showing the integration of public health and ToP facilitation methods. Stay tuned in to the PHiT Committee page on the ToP Network website to see our work product.